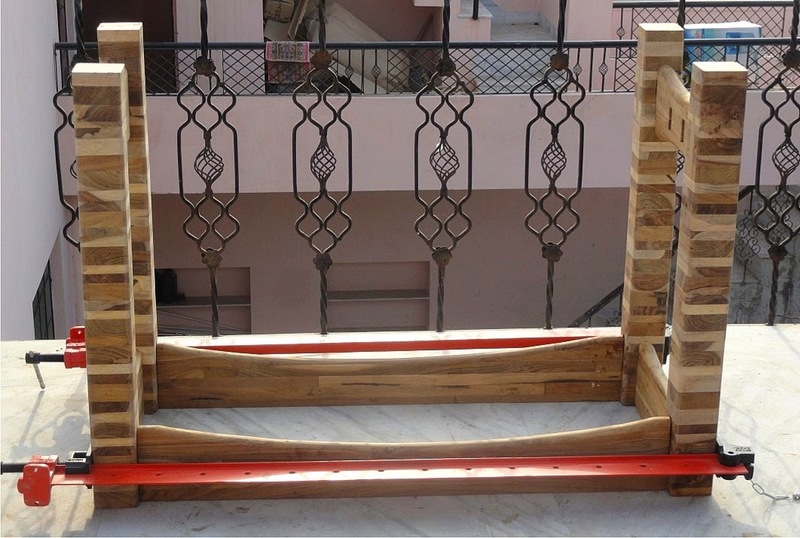 I am pleased to announce the winner of our 100th Milestone Contest: Kishore Singh Parihar of Jodhpur for his remarkable submission of a sturdy trestle table made entirely of scrap wood. 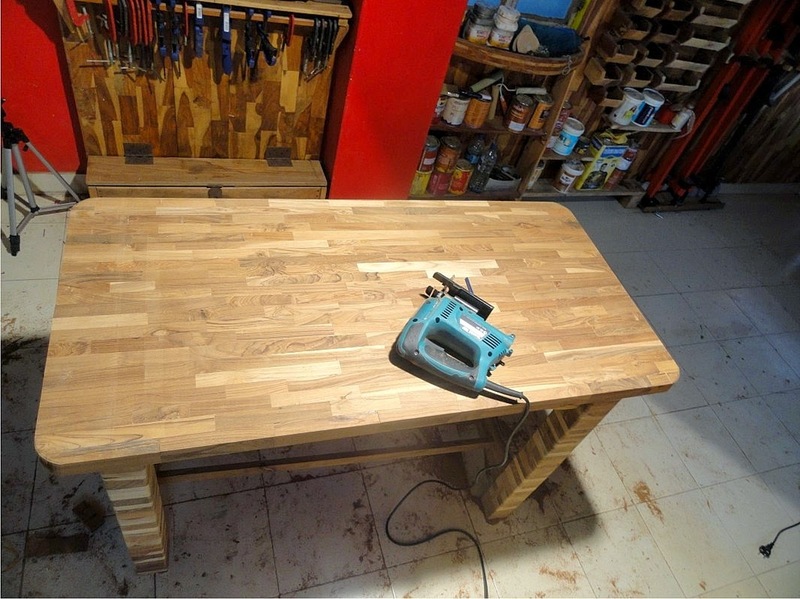 Kishore is a DIY enthusiast who took to woodworking only in 2012 and has pursued his passion single-mindedly. 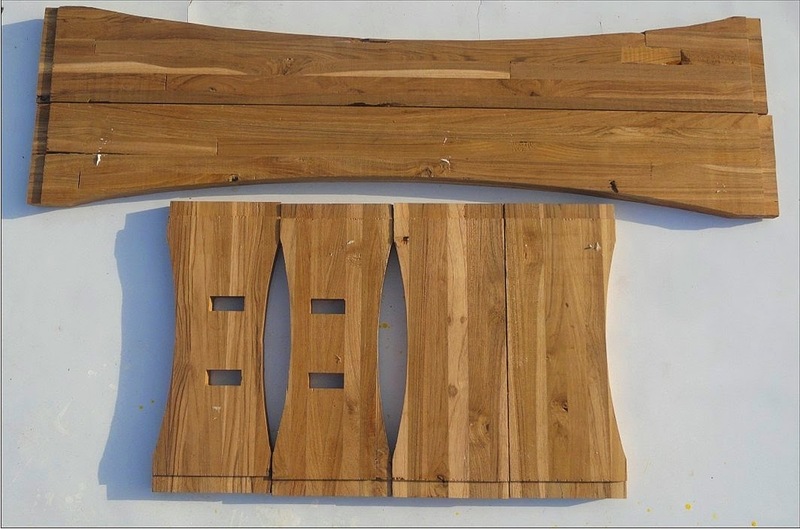 Eco-friendly concept: the idea of using scrap wood destined to end up as firewood or pulp to make functional and aesthetically pleasing objects is a winner. 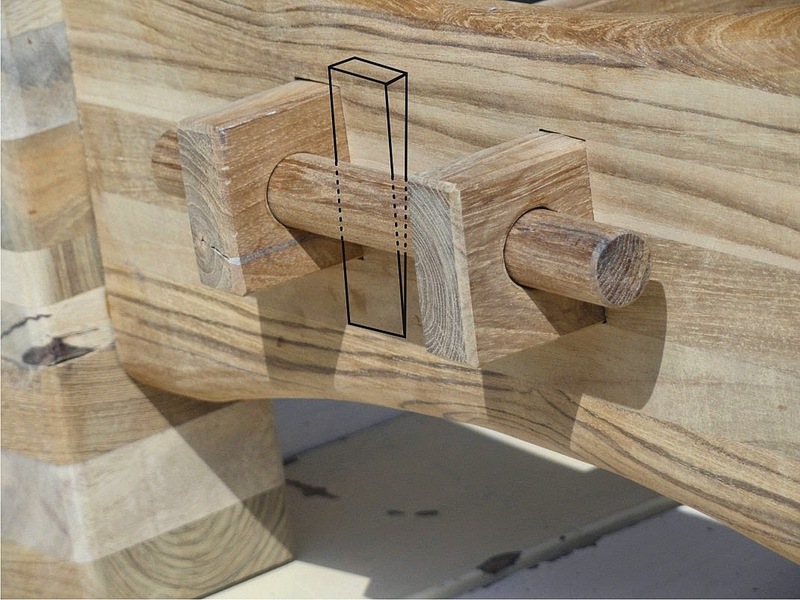 The work is executed well with strong traditional joinery and great attention to detail. 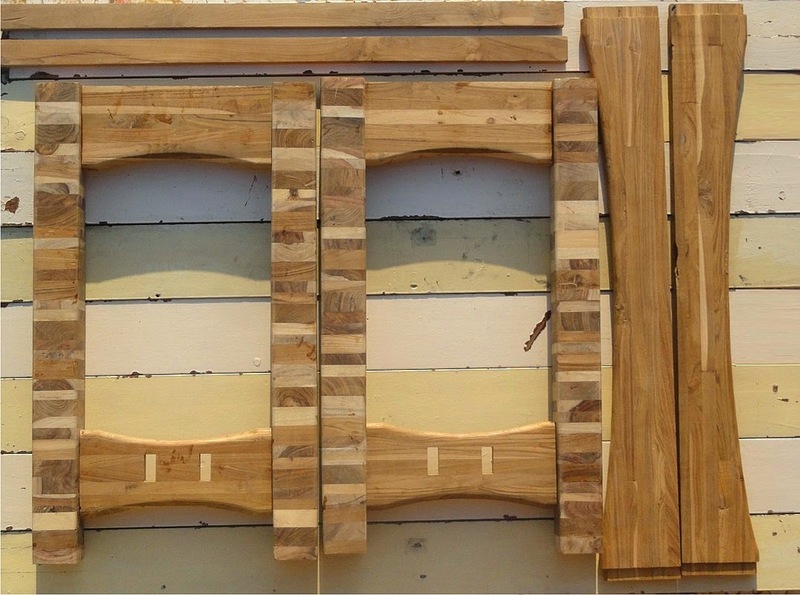 Only locally available tools and materials have been used: I like this because Kishore's work proves that every tool required for woodworking is available in the smallest of Indian towns and can be used innovatively to produce great work. 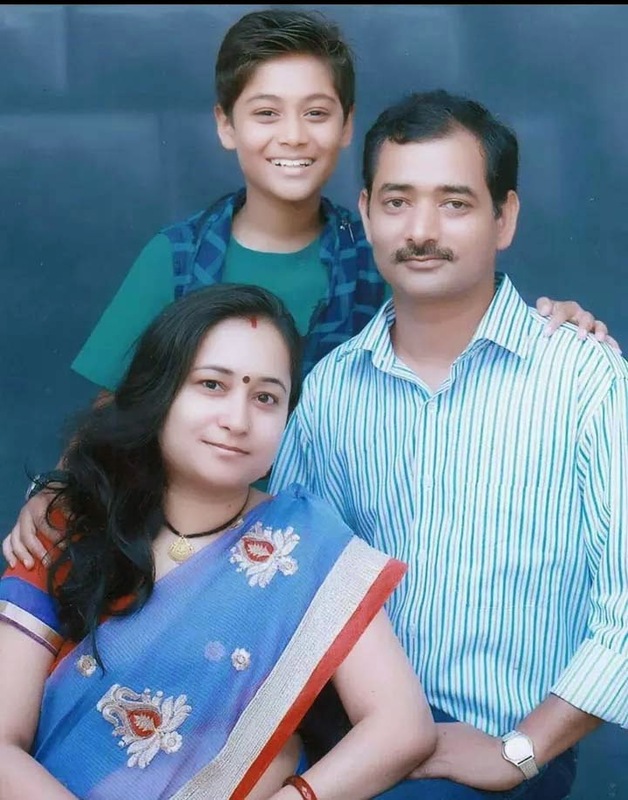 Kishore lives in Jodhpur city, Rajasthan with his parents, two older brothers, son Kaushal and wife Madhur. His wife is a special educator while Kishore is a freelance graphic designer who runs his own small printing press. He works fulltime at his press and only has Sundays for woodworking and everything else. 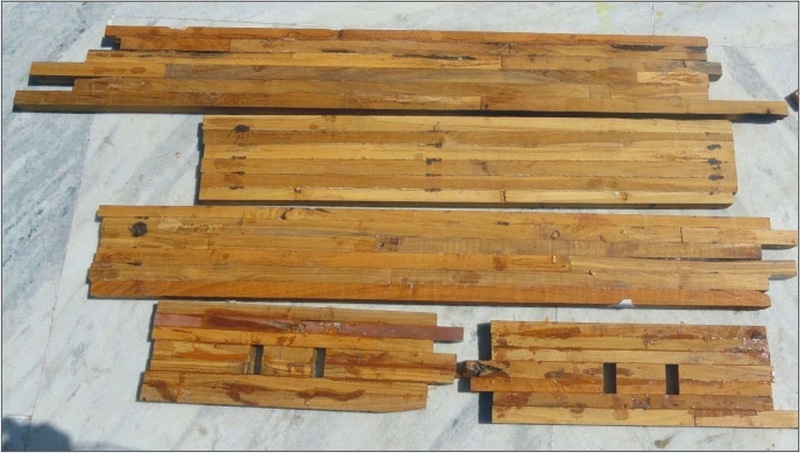 Kishore says he loves wood and his life changed when he discovered a scrap wood dealer in Jodhpur's industrial area. 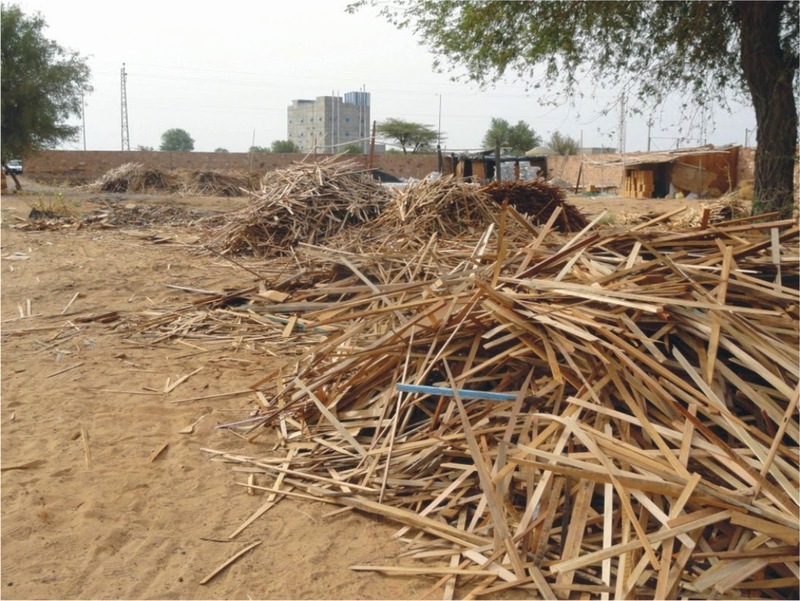 He found tons of surplus and scrap wood from the local handicraft export industries and he realised they were throwing away lots of useable timber. He visited the scrap dealer on Sundays and over time picked up great quantities of wood - initially to build bird houses, none of which were completed. But over time he gathered more than 8 tons of scrap in his house! 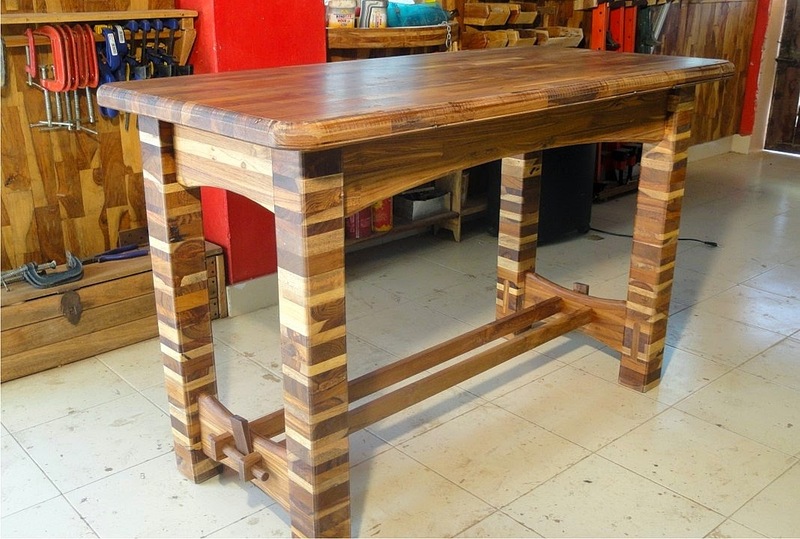 In 2012 he bought a 7 inch table saw, his first power tool and began building a coffee table. "After that I never stopped. Now I want everything wooden in my house", he says. He has made more than 100 items for his home. "All are unique, strong, heavy and beautiful. My goal is to make my home completely wooden (as much as I can). My hobby has become my passion now." His passion shows in his work. He has learnt the craft from the Internet, picked up what tools he could from the local market - no fancy tools, imported jigs or expensive devices - and learnt the most important lesson in woodworking: innovation. 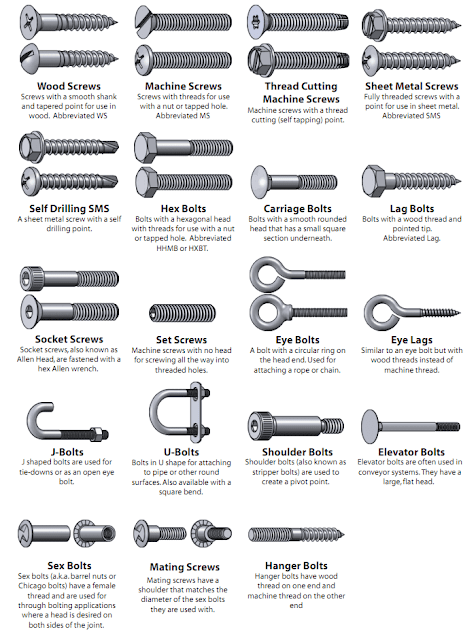 He has inspired me and I hope he will inspire many young hobbyists looking at DIY and woodworking. My journey begins here: at my scrap wood vendor, 20 km from my residence. 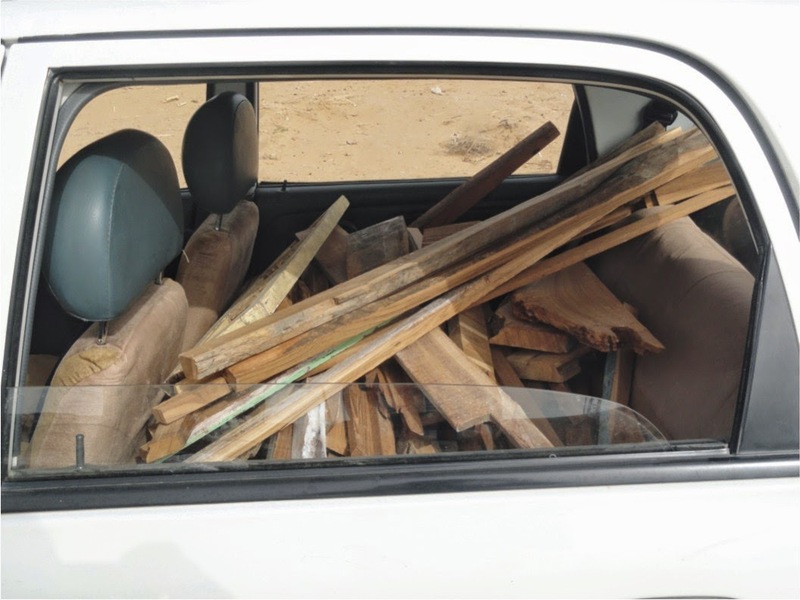 After selecting usable Teak and some big pieces of Sheesham,I cart them in my old Maruti Alto. Sometimes I use my Maruti Van for transporting large scraps. 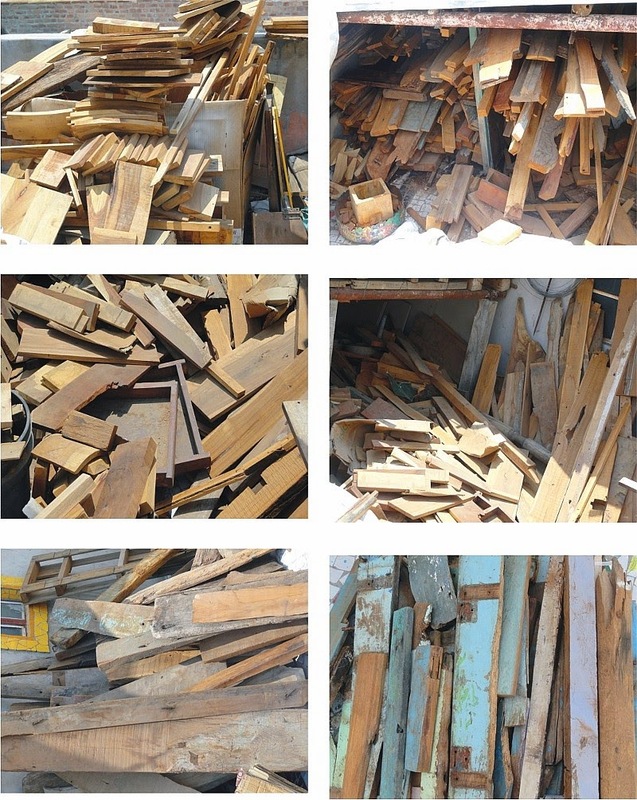 Scrap wood lying on my terrace - some in a tin shed and some under the open sky. With my table saw I cut 4x4 inch pieces - in total more than 200 of them - and glue them together at random. After the glue has dried I size them at my Makita table saw. I had to remove the table saw guard because the glued leg blocks were large. After cutting the excess, each leg piece measures 3x3 inches. The scrap left over is used to make three other projects. 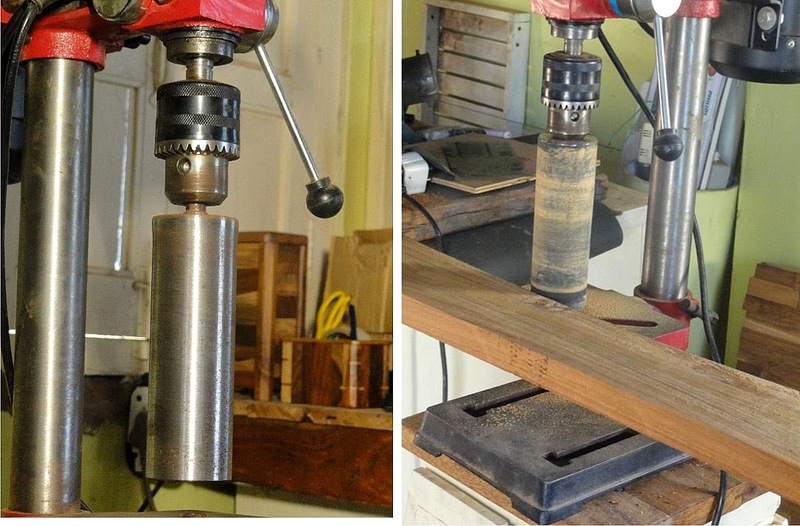 The legs for the table: grooves cut in the legs with a 20mm straight router bit on my home made router table. 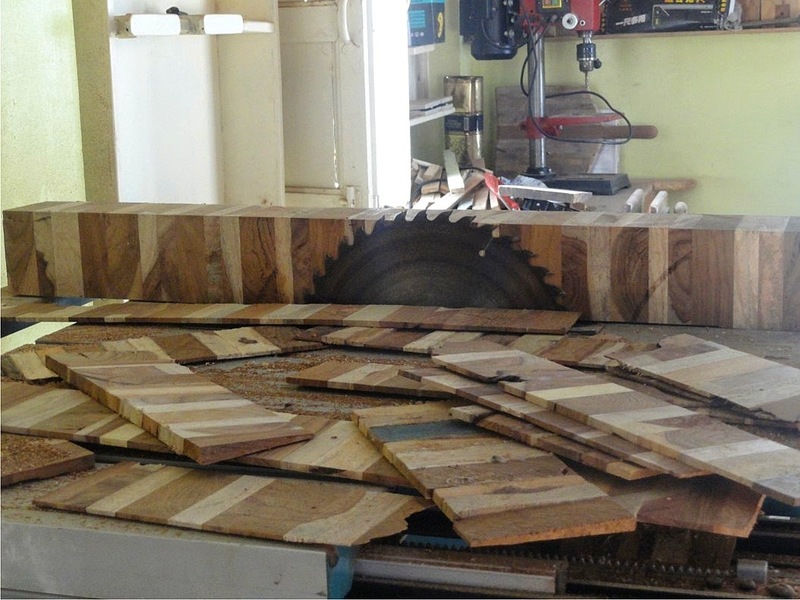 The legs were cut to equal length on the table saw using a stop block. 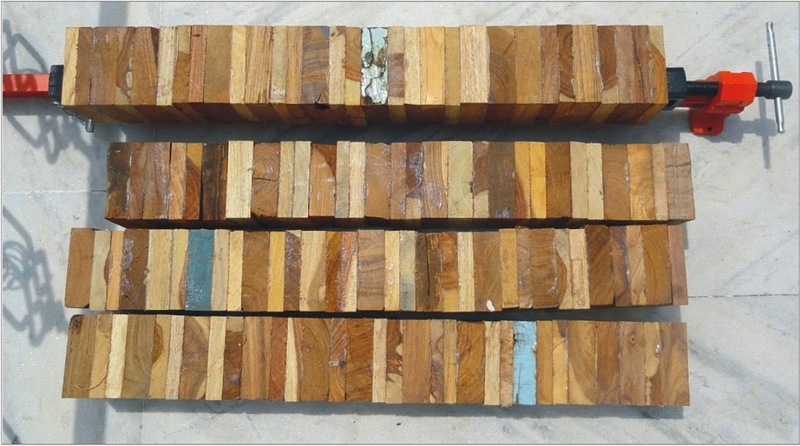 I made boards by joining 1 inch and 2 inch wide teak pieces of varying length one line a day. It took about 180 pieces to make a 3 by 4 foot board. I made the board in two sections so that I could run them through a thickness planer. 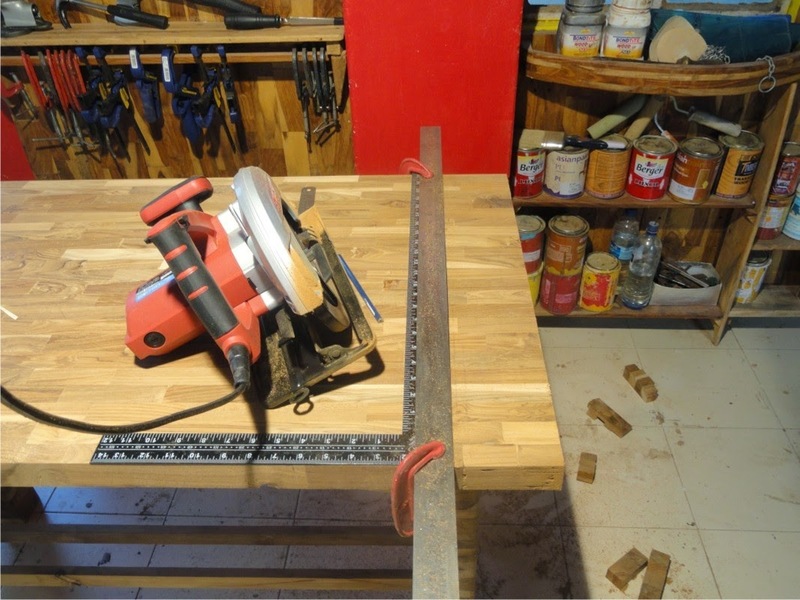 Two of the separately thicknessed boards were glued to make table top. I joined 1 by 1 inch pieces of teak to make the side supports - four for the top and two for the bottom. I marked a curve on the side supports with a paper shredder bin which happened to be handy. 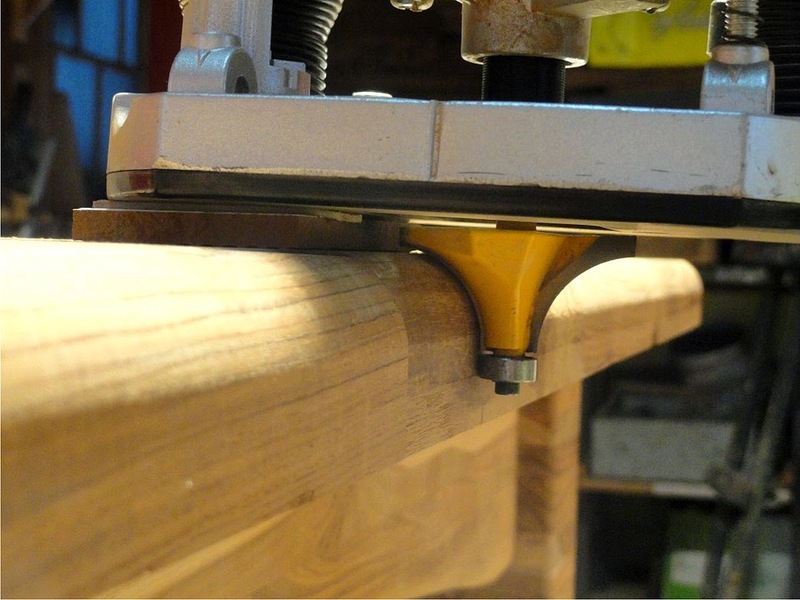 I could not clamp the side pieces to my workbench so I clamped them on my router table. The first cut was so perfect that I did not have to sand it. I used this piece as a template to cut the others. I had to modify the trim bit on my router table because the cutter was just below the template with the bit extended to its maximum. This was done by adding two washers below the bearing. It was not possible to sand the longer curve on the long side supports with my orbital sander. My local lathe machine operator made a perfect drum sander with a pipe. Curves after sanding: The side supports only require fine sanding and are ready for assembly. The legs also need a final sanding before assembly. The table top after sanding: The table top after gluing was slightly uneven; I fixed it with a grinder using a 125 grit sanding disk. There is a small 1 mm dip on one side which I cannot fix. It does not make any difference. Sides of the table joined. For the final assembly I used the perfectly flat marble surface of my balcony. 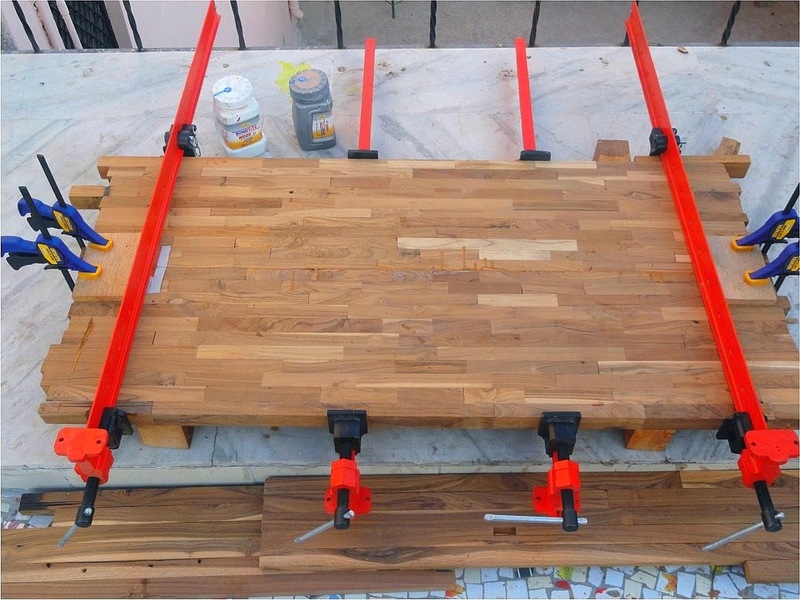 This will ensure that the table sits perfectly flat on top. 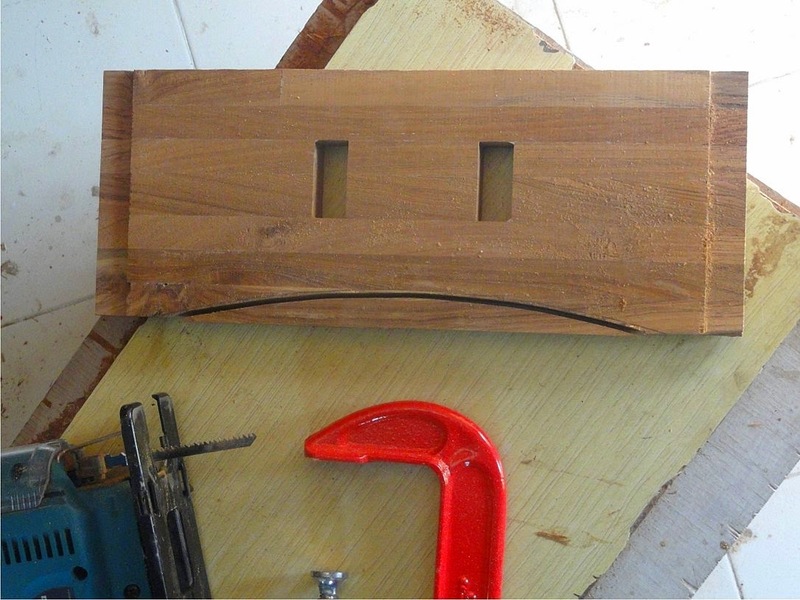 For the table's bottom stretchers, I found two old 48 inch teak pieces from old doors. I removed the pieces without damaging any of them. The wood was oily after all these years and I went through four sanding disks to clean and sand them perfectly. Then the stretchers were clamped and 18 mm holes drilled towards both ends. I made 6 inch long 18 mm wide dowels with a round over bit in my router table. It took a little hand sanding to fit the dowels in the holes on the stretchers. 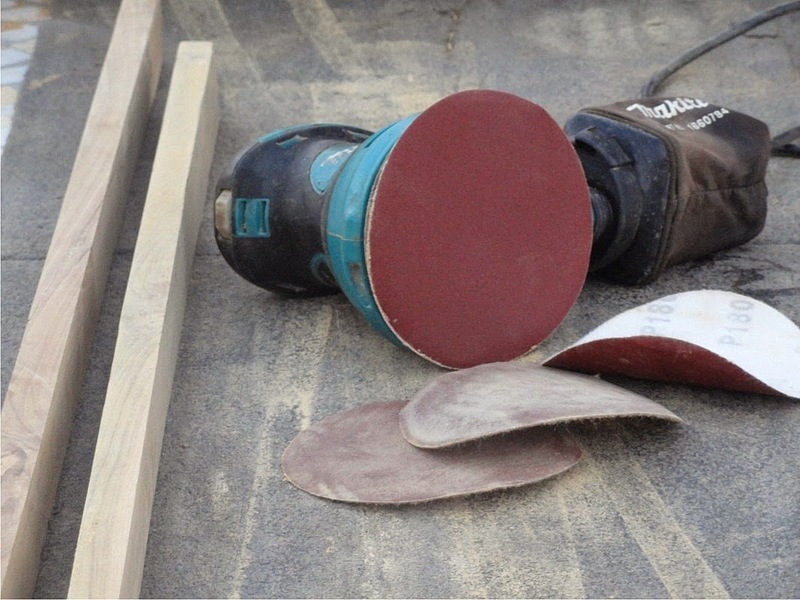 I selected two old brown pieces of scrap to make wedges for the stretchers. 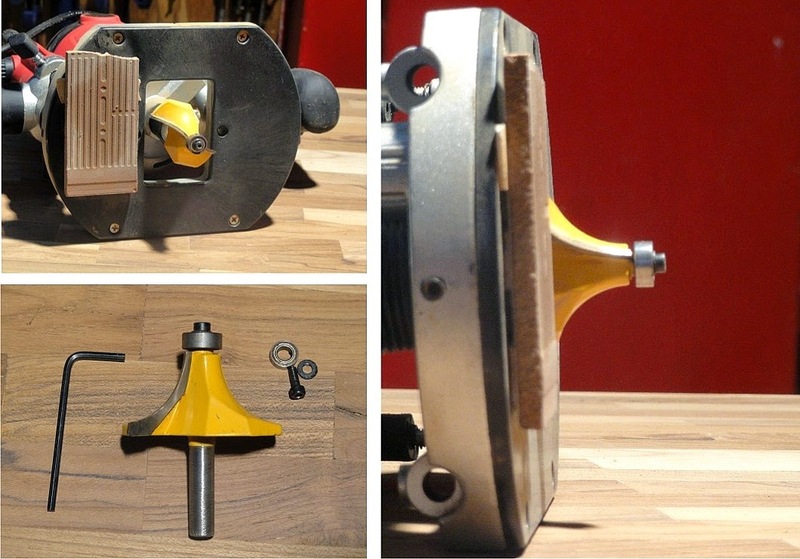 I made this simple jig to cut small wedges on my table saw. All the parts are ready and now it is time to square the edges of the table top. This is the first time I used a circular saw. I used steel rulers as a guide for my Skil saw and was pleased to find it did a good job. 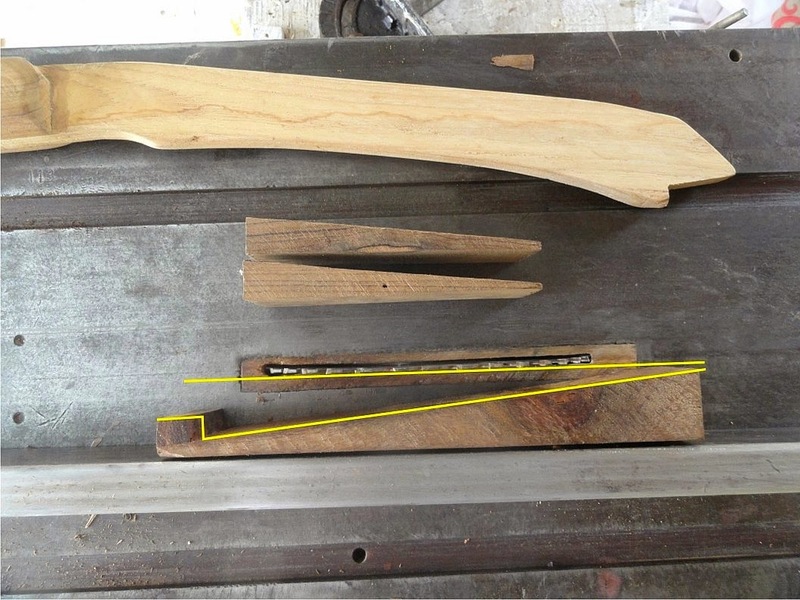 The second cut was made by placing the ruler over a carpenter's square; this gave the Skil saw a good edge to run along. After the top was squared, I marked the corners with a paint can and rounded them with a jig saw. 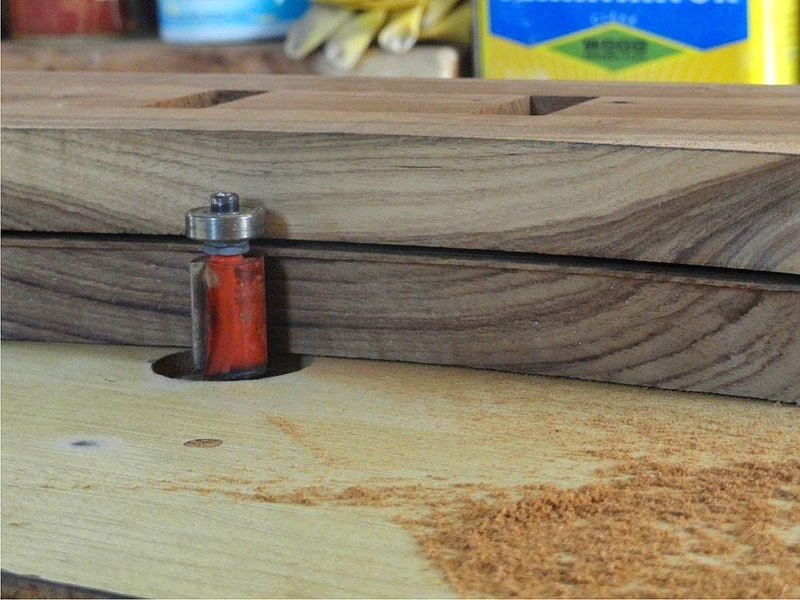 To round over the edges of the table top I used a large round-over router bit. I had to make a few adjustments like adding a ceramic tile to the router base and changing the bit bearing. After two passes the edges were round and smooth with no tear out. 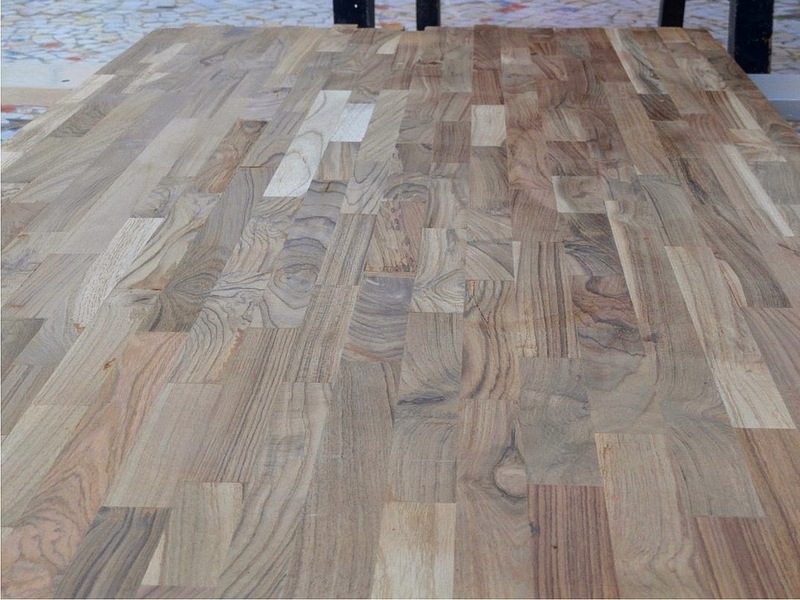 After two coats of matt Melamine finish and a quick final sanding - the table complete! Runner Up to be Announced next week. Congrats Kishore! Your project is indeed prize-worthy. Congrats Kishore! I am going to pay you visit soon! Fantastic project Kishore Sir. I loved the detailed photographs and commentary. 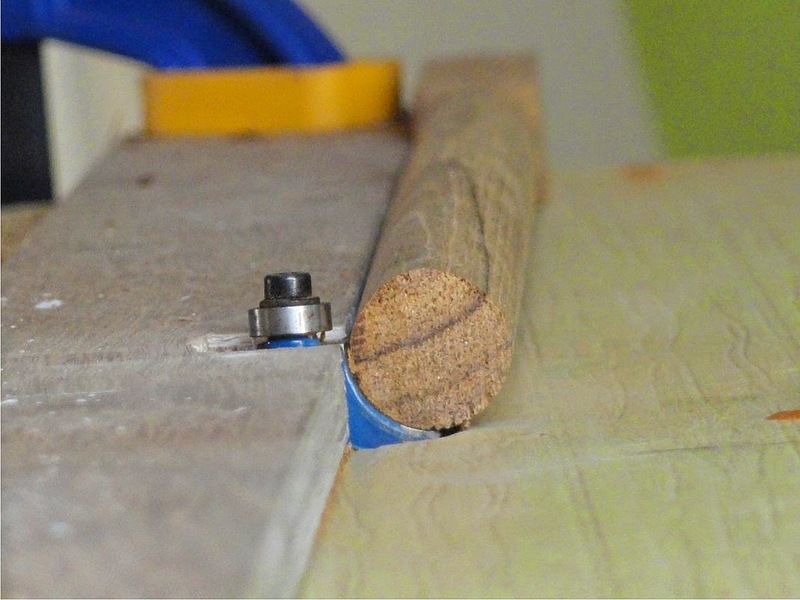 I really liked the dowel and wedge arrangement to clamp things together. This is really neat. Indranil I wonder if it would be possible for Kishore Sir to put up more of his work on this blog. And if it is further possible, (I know this is an imposition) with as much details as he gave on this post. Col. Bala will attest to this, it also happens in the army a lot, if somebody does a good job you don't spend time too much praising him, but you dump more work on him. Thanks Mr. Bala, Vinay & Umaji. 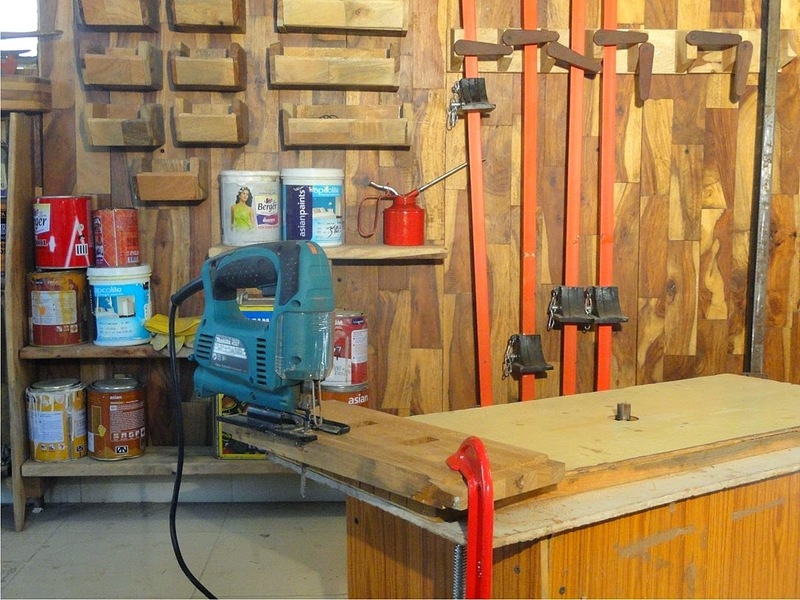 You are most welcome Mr. Bala and I would like to welcome all of DIY Community in my tiny workshop. Just give me one more year to design and make some thing to sit on. Umaji you can check my blog or facebook page for more projects. I prepared this project specially for the contest. I will post detailed post after some time on my blog. That is real good work!! I can't agree any lesser to the winner chosen! Congratulations Kishor, Fantastic project... I also like your eco-friendly concept. I have seen your blog earlier. I was wondering how you joined the that small pieces of wood. Here you have given the procedure with photographs. There are lots of things to learn from you guys. Till now I was working with plywood only now I will try with solid wood. 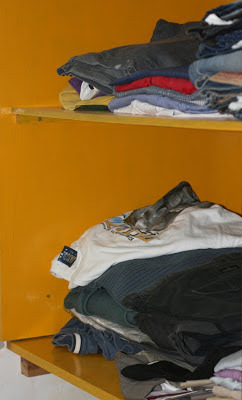 I will have more questions and will keep posting on this blog or may send mail to individuals. I am going to make birdhouse now. thanks for the cardboard box birdhouse idea. I would like to request you to also add how you have made them, with photographs if possible. Thanks Mr Praveen & Khapre. Birdhouses are foundation of my woodworking, but I am not making card board box birdhouses now a days. I will try to post my woodworking / birdhouse procedure later some time. Congratulations Mr Kishore! Great project, beautiful design and excellent execution. Have seen you work and blog before and it's really inspiring. Your philosophy around reuse of scrap is particularly praiseworthy. A befitting winner of the contest to say the least! Thank you also Mr. Indranil for running this context! Brilliant idea to shake things up in the community and fire some imaginations. Thanks Mr Avinash for you kind words. You are right we should thankful to Mr. Indranil for making path for DIYers. I Appreciate His Efforts.